1. Continue meeting as usual. You always have the option to decide to continue meeting as regularly as you have been, but adjust your expectations. Let it be clear from the start that you realize (and everyone else should, too) that your group will be smaller over the summer as people may not attend every time. Smaller groups are not necessarily a bad thing. Sometimes, they give the shy members the courage to speak up or allow you to go rally around one member who really needs some life advice. Decide to get together once a month - so two or three times over the course of the summer - in order to stay in contact without the pressure of weekly meetings. You could make this a Bible-study time or a recreational event. If you really need a break over the summer because your own schedule is crazy, you could ask two or three of your group members to each plan one event. It could be as simple as meeting for coffee or going bowling together. 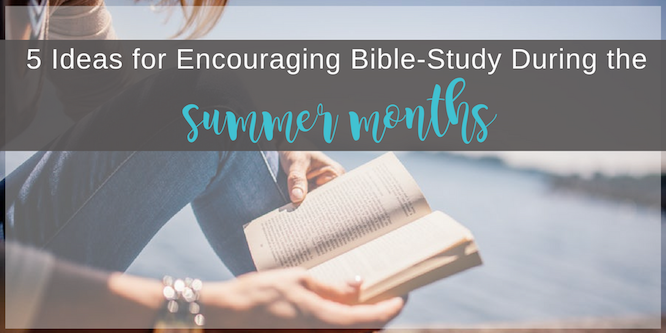 Pair ladies up in twos or threes to stay in touch with each other over the summer and share what they have been learning from the Bible. Each partnership could decide what that looks like. Do they want to grab coffee together once in a while and talk? Do they want to send each other text-message reminders to study the Bible, pray, or share the gospel? Do they want to agree to study a certain topic of the Bible or go through a study guide together and chat about what they’ve learned once a month? 4. Just take a break. You’ve worked hard all year. If you are worn out just reading my suggestions, take a break. Allow yourself to breathe and rest up for another season. Encourage your group to continue studying on their own. Maybe there is a book or topic they’ve been wanting to study. You could have some suggestions for them or send them to my Pinterest account for ideas. 5. Join Scripture Confident Living online. I will be hosting a Scripture Confident Living Online Bible Study this summer, June 4th to July 15th, 2017. We will study through the first book of the “Scripture Confident through the Old Testament” series. This series allows your students to build a strong foundation to dig deeper into Scripture every time and understand the storyline of the Old Testament. “Scripture Confident through the Old Testament” part 1 will get us started with studying the Bible independently and prayerfully. It also introduces the first step of diligent Bible study: Observation. The best thing: Participation is FREE! That’s right! Everyone participating in the Scripture Confident Living Online Bible Study this summer will receive a FREE copy of “Scripture Confident through the Old Testament” part 1. We will study chronologically from Genesis through Ruth, not reading all of the books but studying selected passages in-depth with growing independence. Participants will learn a new Bible study method each Sunday, then practice it throughout the week. We will communicate about what we are learning in a closed Facebook group, only accessible to participants. I have room for 50 women. How? We will chat about what we are learning in a closed Facebook group. Sign up by May 22nd to receive your study-guide in the mail before we begin. Don’t forget to tell your group to sign up, too.